[165 Pages Report] The global reaction monitoring market is expected to reach USD 1.52 Billion by 2022 from USD 1.09 Billion in 2016 at a CAGR of 5.7% during the forecast period. This research study involves the extensive usage of secondary sources, directories, and databases (such as Hoover’s, Bloomberg Business, Factiva, and Avention), in order to identify and collect information useful for this technical, market-oriented, and financial study of the reaction monitoring market. 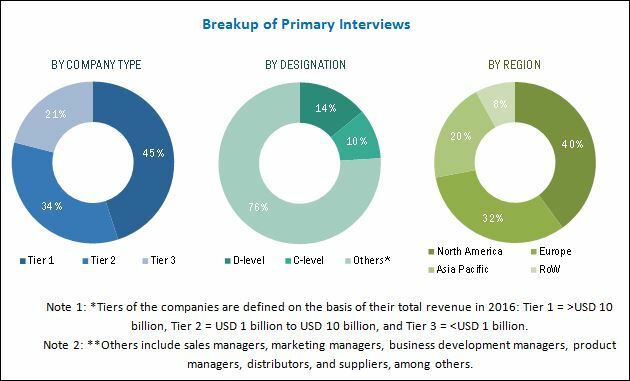 In-depth interviews were conducted with various primary respondents, including subject-matter experts (SMEs), C-level executives of key market players, and industry consultants to obtain and verify qualitative and quantitative information and to assess market prospects. As of 2016, Thermo Fisher Scientific (US), Waters (US), and Agilent Technologies (US) held the leading position in the market. These companies adopted product launches, agreements, and partnerships as their business strategies in the past three years to ensure market dominance. Danaher (US), PerkinElmer (US), Shimadzu (Japan), Bio-Rad Laboratories (US), Bruker (US), Hitachi High-Technologies (Japan), and Merck (Germany) are some of the other major players in market. 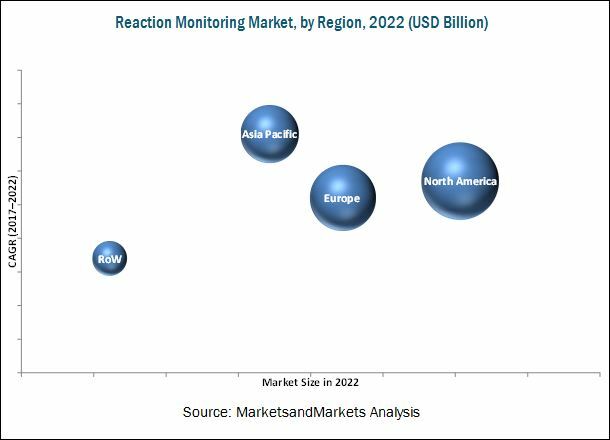 The global reaction monitoring market is projected to reach USD 1.52 Billion by 2022 from USD 1.15 Billion in 2017, at a CAGR of 5.7%. Factors such as stringent regulatory guidelines in the pharmaceutical & biotechnology industry; expansion of the food and beverages industry; and increasing public-private investments in life science research are driving the market. This report broadly segments the reaction monitoring market into technology, reaction mode, and end user. On the basis of technology, the market is categorized into spectroscopy, chromatography, X-ray diffraction, calorimetry, and titrimetry. In 2017, the spectroscopy segment is expected to account for the largest share of the market. The large share of this segment can be attributed to the widespread use of spectroscopic techniques, increasing drug development pipelines, and stringent regulatory compliance for drug manufacturing & food processing protocols. Based on reaction mode, the market is segmented into qualitative reaction mode and quantitative reaction mode. The quantitative reaction mode segment is estimated to command the largest share of the global market in 2017. The large share of this segment is mainly due to factors such as ongoing technological advancements in the field of analytical techniques (such as real-time quantification, device miniaturization, and process automation) and ongoing expansion and modernization of the pharmaceutical & biotechnology and food processing industries. On the basis of end user, the market is segmented pharmaceutical, biopharmaceutical, and biotechnology companies, life science and genomic research facilities, food and beverage industry, pollution monitoring and control industry, and other end users. The pharmaceutical, biopharmaceutical, and biotechnology companies segment is projected to register the fastest rate during the forecast period. This can be attributed to the stringent regulations for pharmaceutical drug development and manufacturing (such as cGMP, cGLP, and EXCiPACT certification) and increasing usage of analytical techniques during quality assessment during drug manufacturing. The report covers the reaction monitoring market across four major geographies, namely, North America, Europe, Asia Pacific, and the Rest of the World (RoW). North America is expected to command the largest share of the market in 2017 due to the availability of private-public funding & investments for life science research, stringent regulatory framework for drug development & commercialization, effective implementation & industrial compliance with food safety regulations, rising adoption of technologically advanced pollution monitoring & control products, and growing number of clinical researches in this region. However, Asia Pacific is expected to register the highest growth rate during the forecast period. Government investments to strengthen food processing & biomedical industry in China & India; rising public emphasis on effective pollution monitoring & control (especially air pollution, water pollution, and biohazard monitoring & control); and increasing public-private funding, investments, & grants for various research activities are some of the major factors driving the growth of the Asia Pacific market.